As noted elsewhere, my home-built signal generator has developed a fault and I need to repair it. This won't be a simple matter (as I'll explain) so I thought it might be of interest here. 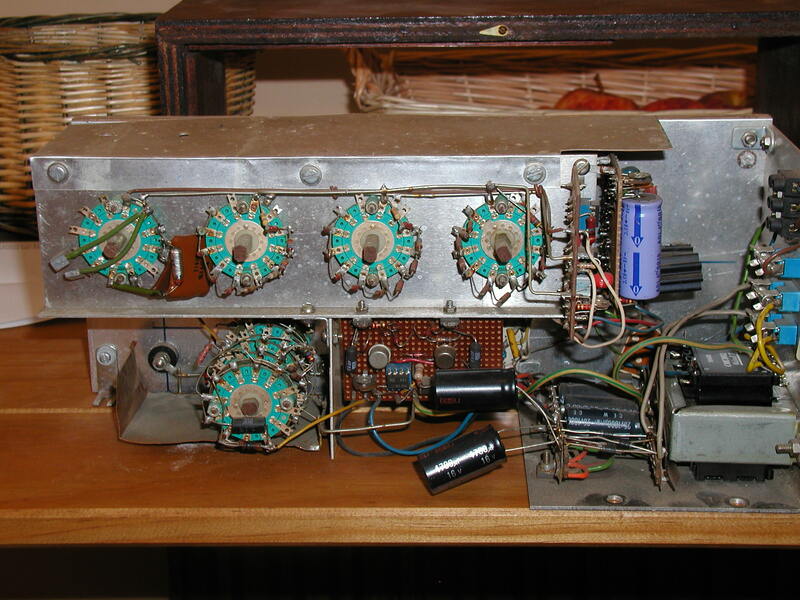 It was first built as just a wien bridge sine wave generator mid 1970s with a maximum output of 0dBm. In the early 1980s I added the square/triangle wave functions, and an amplifier stage to bump up the output level to +20dBm. In the mid 2000s it failed for the first time. Two rectifier diodes had gone short circuit and taken out a fuse. Unfortunately it had also taken out the mains transformer, which to be honest was probably under-rated due to the earlier additions. The new bigger transformer only just fitted in the space available. So, where to start? First off here is a snapshot of the beastie taken out of it's case and cobwebs, dead flies and the worst of the muck sucked out. Original sine wave generator board. Mains transformer with all important fuses above. As you can see, it's quite heavily screened. The top 'box' screens the actual sine wave selection caps and resistors. These were hand picked to get a truly balanced bridge and accurate tracking. The ones you can see are just for the triangle wave shaping. The attenuator switch has a copper foil screen. The lowest output range is -50dBm so this is really necessary. The first problem I have, is that there is no trace anywhere of the original hand-drawn schematics and notes I made, and looking at it reminds me of some of what I did, but not exactly what is on those boards! What we did when we had next to nowt. How do you want to tackle this? I would be tempted to ditch everything but the frequency switching and attenuator and graft that on to one of Duggy Self's TLO72 oscillator designs? Can I mention something about very low signal levels, the -50dB range? We had a problem testing the OD circuits in the HT-5 because it needed -80dBV! Running that out of a genny was next to impossible without getting mostly hum. We used a 'local' 80dB attenuator in a wee tin just 100mm from the jack. ef37a wrote: Oh! Tres elegans! I want to restore it to full health, not murder it! Nothing so modern. A filament bulb running at a very low current - makes it rather microphonic but very reliable and low distortion. Been there. Done that. In fact, when testing a mag PU preamp. I put the preamp in a tobacco tin with a tiny hole for the series resistor of an attenuator to sit half in. I added the extra screening because I found that previously it could pick up hum that was being transmitted through a wooden bench! I rather suspect that the reason adding the extra caps made so little difference is that it is picking up hum radiated from the mains transformer. As a result, the only actual design change I'm considering is fitting a modern switching PSU instead. This would have the addition benefit of allowing me to float the earth. On a number of occasions in the past, ground loops have been a problem, so it'd be nice to get rid of them. Ok, keep the original but yes, ditch the traff. I assume you mean an SMPSU remote from the genny? I have another idea. Fit SLAs or other batteries inside the box and power those from a SMPSU as a charger al la laptop? Not only do you get a fully portable oscillator but also total freedom from mains hum/earth loop problems. Oo! Does it have a meter on the front? If not how about a decently sized VU meter? Maybe a switch for dBV and those daft dBu's? 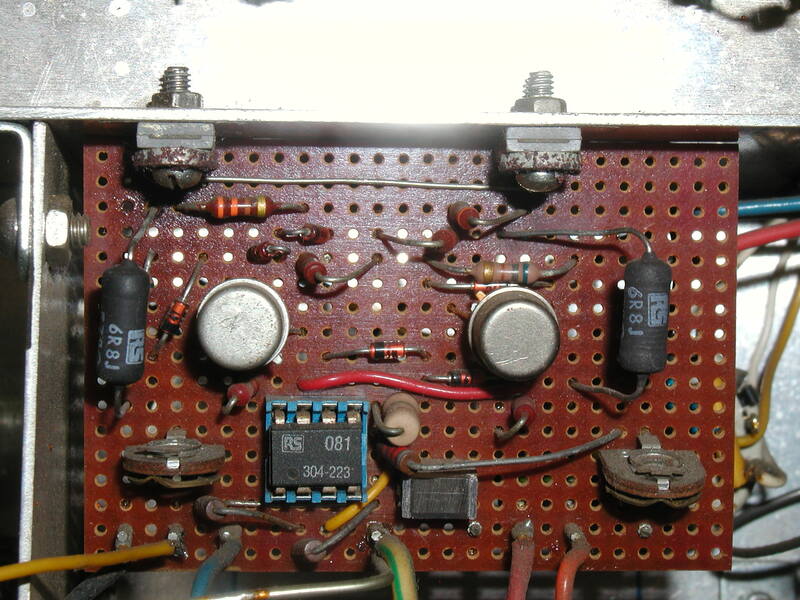 I thought I'd start with the easy... er bit first - the amplifier module. With the extra caps removed there is a clear view of it here. The first thing I noticed was that there is an interloper I'm sure I would have used a 741N for the IC, but there's an 081 sitting there smugly. I don't remember changing it, and I've never loaned the genny out. Oh well. As I can get to both sides of the board fairly easily. I'll leave it in place and just work out a drawing for it. I don't move anything in old kit that doesn't need to! There is only one cap, the input DC blocking one, and that's a mylar type, so no worries there. With the OpAmp bias resistor it gives a -3dB point at 0.1Hz so even a 10Hz square wave is still pretty much flat topped. The two rectangular bits at the top are power transistors. I'm pretty sure they are BD135 and BD136, but I'm not unbolting them to find out. The round cans below are the drive transistors BC441 and BC461. Both of these are nearly obsolete, so I hope they don't ever fail. This is all rather overkill, but the idea was to keep everything as linear as possible regardless of loading. I finally had time to look at this again so here is the schematic of the amplifier board. The input comes from the function switch that sends sine, square or triangle waveforms, already matched in RMS level. Set min and set max are pretty obvious, and the cap and 4.7M resistor remove any possible DC offset. I've shown the actual OpAmp present rather than what I think was originally there. In this particular case, everything is focused on low distortion and load-independent stability. The stack of 4 diodes provide a stable centred bias for the drive transistors (BC441/BC461), but with a twist. They have a small negative temperature coefficient which means that if things start to get a bit hot, the bias is backed off a little and power in the transistors reduced. The other two diodes compensate for the voltage drop of the output pair. Like this each drive transistor essentially sees a 250ohm resistor - that's the actual 560ohm one in parallel with the 6.8ohm one times the output transistor gain (typically x80). I'm pretty sure I would have gain matched those output ones. The combined gain of the complete transistor stage is set by the 220ohm and 330ohm resistors and is very low, only x2.5 and the overall gain - including the OpAmp - is the ratio of the 3.9k resistor against the 6.8k one and the 3.9k preset. It's about x3.2 i.e. 10dB. This whole stage is designed for overall power gain rather than voltage gain. I've no idea what the actual distortion and noise figures are now, but it's definitely very low. The 10dB stepped attenuator follows this so that noise is attenuated along with the signal. I have forgotten what the original fault was! Couple of observations. 4M7, In my exp' very high value resistors tend to go even higher/o/c but modern MFs are probably ok.
Can I ask why the output pair are in common emitter mode rather than the vastly more usual emitter follower style? If you wanted to find the actual distortion, Right Mark Analyser is free and I doubt your KA6 would add much to the proceedings? ef37a wrote: I have forgotten what the original fault was! Quite agree. Also I'm thinking of halving the resistor and doubling the cap - easy to do these days. Another good point, only these seem to have held up rather well. Output range seems quite correct, with an ordinary meter and set at 100Hz. A side benefit is that the design is intrinsically S/C safe due to the current control, whereas (without special protection) emitter-follower types will just try to supply as much current as the S/C demands. Well that's Windows, so nothing I can run here. However, I would think that far more distortion is created in the wien oscillator itself. I'll be looking at that next, but will have to detach it to do so. Well, I carefully removed the beast's heart and drew out the schematic, and you can see it here. I think I must have been on a controlled substance when I laid out the board, it was a nightmare to follow (well it was the mid 1970s). I had intended to take a photo before I put it back, but forgot. Anyway, the details. Notice the new, exciting (and expensive) idea of using an FET for the input - 2N3819. This was necessary as the bias current for an ordinary transistor would have resulted in very erratic DC conditions on different switch ranges. Also a transistor's impedance would have unbalanced the wien network depending on the resistances being switched in. The 22u cap was originally a Tantalum type, but this had gone very leaky completely defeating the offset zero It's now an ordinary modern electrolytic, shunted with a new 'dry' cap for the upper frequencies. The two BC107s are constant current generators for the 2n3819 and the following BC109C (a high gain transistor). There was another tantalum capacitor. This was the other 22u one that was supposed to smooth the supply to the first two current generators. This had gone completely O/C and was the cause of the HF stability problem. This also is now an ordinary modern cap. The BC461 is a second amplifier/output stage, with a rather unusual arrangement where the BC441 is used as a current generator for this, instead of a true push-pull output. The diodes dotted around are all used to offset the transistor b/e voltages and have a similar thermal characteristic. The really odd bit is those two filament lamps These are used to control the amplitude of the oscillator. As the signal level rises they heat up, increasing their resistance. This increases the negative feedback so inhibiting any further amplitude rise. Unfortunately there are no markings on them so I've no idea now what exactly they are. They don't actually light up, the current is so low that the heating effect is very small indeed. Originally the LH one didn't go direct to the ground line, but went via a huge cap. I'm not quite sure why I did that, but guess that was to stop any DC offset heating the filaments and changing the amplitude as a result. However, I tested with it shorted and with various deliberate misaligned offsets and the difference really wasn't worth worrying about so I removed it completely. The remaining caps all seem fine, so I left them alone. With this all put back together the stability problem is cured and all ranges seem OK.
With the important parts of the genny sorted, I'll take a look at the square/triangle conversion board later. I'll also definitely be changing the power supply. What a fun look at old diy. I'm enjoying seeing what part numbers are still available enough that I've got them in my stash vs whats gotten rare. Do you mind sharing what analyser you used? As a diy/audio/linux geek, I'd like to have it in my back pocket even if I don't need it this minute. Funkyflash5 wrote: What a fun look at old diy. I'm enjoying seeing what part numbers are still available enough that I've got them in my stash vs whats gotten rare. I think I may have thought of a way to discover what the lamps are. These are miniature bi-pin ones. I'll measure the cold resistance, then next time I'm at work I'll go through the ones there, and see if I can find any of a similar size and resistance. The analyser is a very cut-down display. It requires jack running and is called japa (JACK and ALSA Perceptual Analyser) . It is developed by Fons Adriaensen and available here . Also on most distros. The first is quite embarrassing. I said a cap on the oscillator board was not needed, because there wasn't much DC drift. Well that was true when everything was outside the case - quite a different matter when fully enclosed. So cap is reinstated, only it's much smaller. The original was 4700u 25V. The new one is 1000u 6.3V - and a fraction of the size! I've also now set a deliberate very small offset to ensure the cap never spends any time reversed. The second mistake was slipping with a meter probe when measuring voltages on the square/triangle board. I thought I'd got away with it as everything seemed to still work... until I realised the output level had changed quite dramatically, and square/triangle waves were very asymmetric. Applying the meter more carefully soon showed up the -13.5V rail being about -10V and rather wobbly. What I hadn't noticed before is that under the tagstrips that held the rectifiers and smoothing caps there were two transistors acting as simple emitter-follower regulators set with 14V zener diodes. I had totally forgotten I'd done this. The negative one had popped its clogs so the zener and its resistor were trying to do all the work. Replacing this (rather a fiddly job) awoke another sleeping dragon. When I powered up again there was a lot of 100Hz ripple on the output and the output was all over the place at lower frequencies. Checking the 13.5v rails seemed to give the right figures, but this time the positive one seemed slightly low. Switch off. Check everything. Switch on - all OK.
Switch off. Check again. Switch on - 13.5V rail a bit low... +18V rail about 14V. Rattle about with a screwdriver handle - fault clears. My first thought was a dodgy rectifier. Pulling out the low voltage fuses I silently thanked my former self for fitting them, as I could now test all the diodes without the transformer windings confusing things. No problems that I could find, and soldering looked perfect (I would say that of course). So, had messing about with the assembly disturbed the caps? Again soldering looked good, but under test I found the trying to move the positive reservoir cap made the fault come and go. So, must be bad soldering there... well no. Even under a magnifying glass it looked fine. Even so, I re-flowed the joints with fresh solder, but the fault was still there. Since you'd blowed one up mate, did you consider replacing the regulators with modern 317 types? Intermittent big cap..VERY rare, unlucky thee. Probably because at the time my bits box only had a pair of 14V zeners. In actual fact any pair giving a result of at least 10V would have done, so I'll probably end up using fixed 12V regulators. There's me thinking you will come back with some deep calculations you did ref the amplitude stabilizing lamps! I would have done my usual bluff and said, "Headroom." Then nodded sagely.